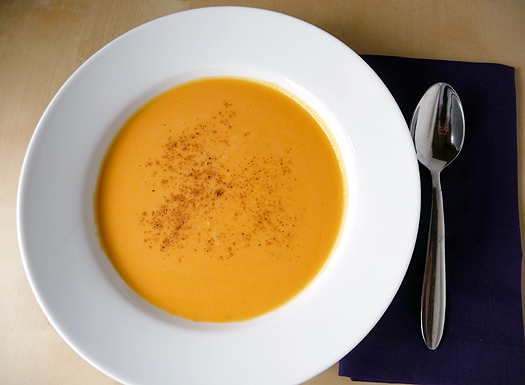 Since we’ve time-traveled right to January today, I thought I’d share with you one of my favorite cold-weather recipes: butternut squash soup. It is quintessentially fall and the perfect, hearty soup to warm you up on a cold (wintery-feeling) autumn night. I didn't make this particular bowl, but my soup looks a heck of a lot like it! Just a slight disclaimer…I tend not to really measure things, so the amounts I’ve listed below are estimations. Trust your taste buds! 1. Preheat your oven to 425 degrees. Cut the butternut squash in half and scoop out the seeds (you can set these aside and toast them later!) Drizzle with olive oil and sprinkle with some salt and pepper, then place the halves of squash face-down and roast for 30-40 minutes. Remove and let cool before handling. Peel the skin away and cut into cubes. 2. In a large pot, heat the olive oil over medium heat and add the minced ginger and garlic. Saute for about 2 minutes until fragrant. Add the veggie stock, let it come to a slight boil then turn down the heat and let it simmer for a few minutes. 3. Combine the squash and the veggie stock in a food processor or a blender (depending on the size of the squash, I often have to do this in two batches). I also recommend slowly adding the stock so you can achieve the desired thickness. 4. Once it is blended and smooth, return the soup to your pot and place back on the stove over medium-low heat. Add your spices, to taste. Just as you did with the stock, slowly add the cream until you reach the desired consistency. 5. Serve with hazelnut garnish and your favorite thick-toasted bread on the side.